This book is intended for an undergraduate or MBA level Financial Accounting course. It covers the standard topics in a standard sequence, utilizing the Socratic method of asking and answering questions. A First Course in Linear Algebra is an introductory textbook aimed at college-level sophomores and juniors. Typically students will have taken calculus, but it is not a prerequisite. The book begins with systems of linear equations, then covers matrix algebra, before taking up finite-dimensional vector spaces in full generality. The final chapter covers matrix representations of linear transformations, through diagonalization, change of basis and Jordan canonical form. Determinants and eigenvalues are covered along the way. A unique feature of this book is that chapters, sections and theorems are labeled rather than numbered. For example, the chapter on vectors is labeled "Chapter V" and the theorem that elementary matrices are nonsingular is labeled "Theorem EMN." Another feature of this book is that it is designed to integrate SAGE, an open source alternative to mathematics software such as Matlab and Maple. The author includes a 45-minute video tutorial on SAGE and teaching linear algebra. For students: The book comes with supplemental archetypes and printable flashcards. This textbook has been used in classes at: Centre for Excellence in Basic Sciences, Westmont College, University of Ottawa, Plymouth State University, University of Puget Sound, University of Notre Dame, Carleton University, Amherst College, Felician College, Southern Connecticut State University, Michigan Technological University, Mount Saint Mary College, University of Western Australia, Moorpark College, Pacific University, Colorado State University, Smith College, Wilbur Wright College, Central Washington U (Lynwood Center), St. Cloud State University, Miramar College, Loyola Marymount University. This is a book about how to prove theorems. Until this point in your education, you may have regarded mathematics primarily as a computational discipline. You have learned to solve equations, compute derivatives and integrals, multiply matrices and find determinants; and you have seen how these things can answer practical questions about the real world. In this setting, your primary goal in using mathematics has been to compute answers. But there is another approach to mathematics that is more theoretical than computational. In this approach, the primary goal is to understand mathematical structures, to prove mathematical statements, and even to invent or discover new mathematical theorems and theories. The mathematical techniques and procedures that you have learned and used up until now have their origins in this theoretical side of mathematics. For example, in computing the area under a curve, you use the fundamental theorem of calculus. It is because this theorem is true that your answer is correct. However, in your calculus class you were probably far more concerned with how that theorem could be applied than in understanding why it is true. But how do we know it is true? How can we convince ourselves or others of its validity? Questions of this nature belong to the theoretical realm of mathematics. This book is an introduction to that realm. This book will initiate you into an esoteric world. You will learn and apply the methods of thought that mathematicians use to verify theorems, explore mathematical truth and create new mathematical theories. This will prepare you for advanced mathematics courses, for you will be better able to understand proofs, write your own proofs and think critically and inquisitively about mathematics. Our primary goal in writing College Success is to help you succeed in college. According to Department of Education data, 30 percent of college freshmen leave school in their first year and as many as 50 percent never graduate. College Success is designed to help change that. College Success has a student-friendly format arranged to help you develop the essential skills and provide the information you need to succeed in college. This is not a textbook full of theory and extensive detail that merely discusses student success; rather, this is a how-to manual for succeeding in college. The book provides realistic, practical guidance ranging from study skills to personal health, from test taking to managing time and money. Furthermore, College Success is accessible—information is presented concisely and as simply as possible. College Success has the following features to help you achieve your goals: Each chapter asks you to evaluate yourself because success starts with recognizing your strengths and weaknesses, your hopes and desires, and your own personal, individual realities. You’ll develop your own goals based on these self-assessments, determining what success in college really means for you as an individual. Throughout the book, you will find numerous interactive activities created to help you improve your skills. To assist you with this, the material is presented in easily digestible “chunks” of information so you can begin applying it immediately in your own life—and get the most out of your college education. Published in 1991 by Wellesley-Cambridge Press, the book is a useful resource for educators and self-learners alike. It is well organized, covers single variable and multivariable calculus in depth, and is rich with applications. In addition to the Textbook, there is also an online Instructor's Manual and a student Study Guide. 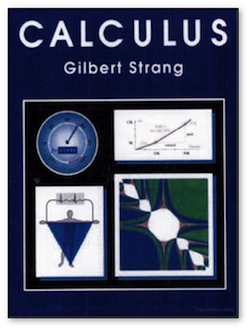 Prof. Strang has also developed a related series of videos, Highlights of Calculus, on the basic ideas of calculus. 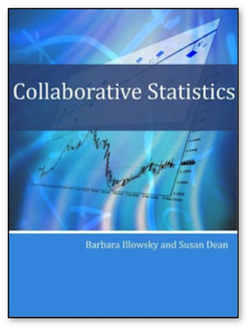 Collaborative Statistics was written by Barbara Illowsky and Susan Dean, faculty members at De Anza College in Cupertino, California. The textbook was developed over several years and has been used in regular and honors-level classroom settings and in distance learning classes. Courses using this textbook have been articulated by the University of California for transfer of credit. 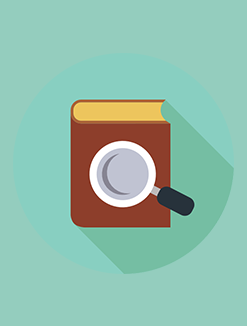 The textbook contains full materials for course offerings, including expository text, examples, labs, homework, and projects. A Teacher’s Guide is currently available in print form and on the Connexions site at and supplemental course materials including additional problem sets and video lectures are available. The on-line text for each of these collections collections will meet the Section 508 standards for accessibility. An on-line course based on the textbook was also developed by Illowsky and Dean. It has won an award as the best on-line California community college course. The on-line course will be available at a later date as a collection in Connexions, and each lesson in the on-line course will be linked to the on-line textbook chapter. The on-line course will include, in addition to expository text and examples, videos of course lectures in captioned and non-captioned format. 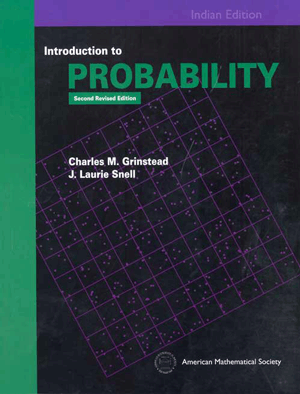 The original preface to the book as written by professors Illowsky and Dean, now follows: This book is intended for introductory statistics courses being taken by students at two– and four–year colleges who are majoring in fields other than math or engineering. Intermediate algebra is the only prerequisite. The book focuses on applications of statistical knowledge rather than the theory behind it. The text is named Collaborative Statistics because students learn best by doing. In fact, they learn best by working in small groups. The old saying “two heads are better than one” truly applies here. Our emphasis in this text is on four main concepts: These concepts are integral to our course. Students learn the best by actively participating, not by just watching and listening. Teaching should be highly interactive. Students need to be thoroughly engaged in the learning process in order to make sense of statistical concepts. Collaborative Statistics provides techniques for students to write across the curriculum, to collaborate with their peers, to think statistically, and to incorporate technology. This book takes students step by step. The text is interactive. Therefore, students can immediately apply what they read. Once students have completed the process of problem solving, they can tackle interesting and challenging problems relevant to today’s world. The problems require the students to apply their newly found skills. In addition, technology (TI-83 graphing calculators are highlighted) is incorporated throughout the text and the problems, as well as in the special group activities and projects. The book also contains labs that use real data and practices that lead students step by step through the problem solving process. At De Anza, along with hundreds of other colleges across the country, the college audience involves a large number of ESL students as well as students from many disciplines. The ESL students, as well as the non-ESL students, have been especially appreciative of this text. They find it extremely readable and understandable. Collaborative Statistics has been used in classes that range from 20 to 120 students, and in regular, honor, and distance learning classes. 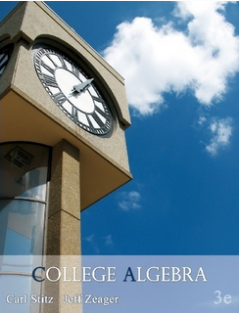 College Algebra is an introductory text for a college algebra survey course. The material is presented at a level intended to prepare students for Calculus while also giving them relevant mathematical skills that can be used in other classes. The authors describe their approach as "Functions First," believing introducing functions first will help students understand new concepts more completely. Each section includes homework exercises, and the answers to most computational questions are included in the text (discussion questions are open-ended). Graphing calculators are used sparingly and only as a tool to enhance the Mathematics, not to replace it. The authors also offer a Precalculus version of this text, which has two extra chapters covering Trigonometry. It is essential to lay a solid foundation in mathematics if a student is to be competitive in today’s global market. The importance of algebra, in particular, cannot be overstated, as it is the basis of all mathematical modeling used in applications found in all disciplines. Traditionally, the study of algebra is separated into a two parts, elementary algebra and intermediate algebra. This textbook, Elementary Algebra, is the first part, written in a clear and concise manner, making no assumption of prior algebra experience. It carefully guides students from the basics to the more advanced techniques required to be successful in the next course. This text is, by far, the best elementary algebra textbook offered under a Creative Commons license. It is written in such a way as to maintain maximum flexibility and usability. A modular format was carefully integrated into the design. For example, certain topics, like functions, can be covered or omitted without compromising the overall flow of the text. An introduction of square roots in Chapter 1 is another example that allows for instructors wishing to include the quadratic formula early to do so. Topics such as these are carefully included to enhance the flexibility throughout. 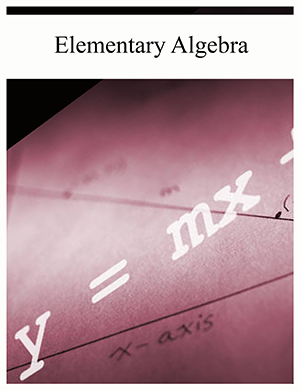 This textbook will effectively enable traditional or nontraditional approaches to elementary algebra. This, in addition to robust and diverse exercise sets, provides the base for an excellent individualized textbook instructors can use free of needless edition changes and excessive costs! A few other differences are highlighted below: This text employs an early-and-often approach to real-world applications, laying the foundation for students to translate problems described in words into mathematical equations. It also clearly lays out the steps required to build the skills needed to solve these equations and interpret the results. With robust and diverse exercise sets, students have the opportunity to solve plenty of practice problems. In addition to embedded video examples and other online learning resources, the importance of practice with pencil and paper is stressed. This text respects the traditional approaches to algebra pedagogy while enhancing it with the technology available today. In addition, textual notation is introduced as a means to communicate solutions electronically throughout the text. While it is important to obtain the skills to solve problems correctly, it is just as important to communicate those solutions with others effectively in the modern era of instant communications. The author's goals in writing Exploring Business Version 2.0 was simple: introduce students to business in an exciting way. Exploring Business is adapted from a work produced by a publisher who has requested that they and the original author not receive attribution. This adapted edition is produced by the University of Minnesota Libraries Publishing through the eLearning Support Initiative. Though the publisher has requested that they and the original author not receive attribution, this adapted edition reproduces all original text and sections of the book, except for publisher and author name attribution. This textbook has been used in classes at: College of Alameda, Columbia Basin College, Flagler College, Johnson County Community College, Pasadena City College, Penn State University, Renton Technical College, San Diego Mesa College, Sierra College, Yuba College. Information Systems: A Manager’s Guide to Harnessing Technology is intended for use in undergraduate and/or graduate courses in Management Information Systems and Information Technology. The teaching approach in Information Systems: A Manager’s Guide to Harnessing Technology can change this. The text offers a proven approach that has garnered student praise, increased IS enrollment, and engaged students to think deeper and more practically about the space where business and technology meet. Every topic is related to specific business examples, so students gain an immediate appreciation of its importance. Rather than lead with technical topics, the book starts with strategic thinking, focusing on big-picture issues that have confounded experts but will engage students. And while chapters introduce concepts, cases on approachable, exciting firms across industries further challenge students to apply what they've learned, asking questions like: Why was Netflix able to repel Blockbuster and WalMart? How did Harrah's Casino's become twice as profitable as comparably-sized Caesar's, enabling the former to acquire the latter? How does Spain's fashion giant Zara, a firm that shuns the sort of offshore manufacturing used by every other popular clothing chain, offer cheap fashions that fly off the shelves, all while achieving growth rates and profit margins that put Gap to shame? Why do technology markets often evolve into winner-take-all or winner take-most scenarios? And how can managers compete when these dynamics are present? Why is Google more profitable than Disney? How much is Facebook really worth? The teaching approach in this text encourages students to think deeper and more practically about the space where business and technology meet. Every topic is related to specific business examples, so students gain an immediate appreciation of its importance. Rather than starting with technical topics, the book starts with strategic thinking, focusing on big-picture issues that interest students. International Finance Theory and Policy is built on Steve Suranovic’s belief that to understand the international economy, students need to learn how economic models are applied to real world problems. It is true what they say, that ”economists do it with models.“ That’s because economic models provide insights about the world that are simply not obtainable solely by discussion of the issues. 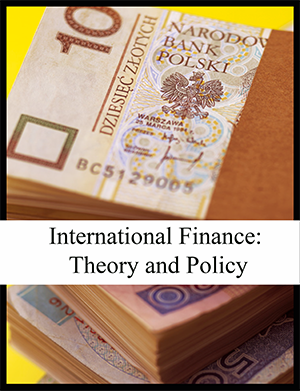 International Finance Theory and Policy develops a unified model of the international macroeconomy. The text provides detailed descriptions of major macroeconomic variables, covers the interest rate parity and purchasing power parity theories of exchange rate determination, takes an exhaustive look at the pros and cons of trade imbalances and presents the well-known AA-DD model to explore the effects of fiscal and monetary policy under both fixed and flexible exchange rates. The models are developed, not by employing advanced mathematics, but rather by walking students through a detailed description of how a model’s assumptions influence its conclusions. But more importantly, each model and theory is connected to real world policy issues. The Finance Text has the following unique features: o Begins with an historical overview of the international macroeconomy to provide context for the theory. o Concludes with a detailed discussion of the pros and cons of fixed and floating exchange rate systems. o Provides an extensive look at the issue of trade imbalances. Readers learn techniques to evaluate whether a country's trade deficit (or surplus) is dangerous, beneficial, or benign. o Explains how purchasing power parity is used to make cross country income comparisons. o Offers clear detailed explanations of the AA-DD model. o Applies the AA-DD model to understand the effects of monetary and fiscal policy on GDP, the exchange rate, and the trade balance. International Finance Theory and Policy by Steve Suranovic is intended for a one-semester course in International Finance. After March 2010, you can check out the entire book online or request a desk copy. International Trade: Theory and Policy is built on Steve Suranovic’s belief that to understand the international economy, students need to learn how economic models are applied to real world problems. It is true what they say, that ”economists do it with models.“ That’s because economic models provide insights about the world that are simply not obtainable solely by discussion of the issues. International Trade: Theory and Policy presents a variety of international trade models including the Ricardian model, the Heckscher-Ohlin model, and the monopolistic competition model. It includes trade policy analysis in both perfectly competitive and imperfectly competitive markets. The text also addresses current issues such as free trade area formation and administered protection policies. The models are developed, not by employing advanced mathematics, but rather by walking students through a detailed description of how a model’s assumptions influence its conclusions. But more importantly, each model and theory is connected to real world policy issues. The main purpose of the text is to provide a thorough grounding in the arguments concerning the age-old debate about free trade versus protectionism. This text has the following unique features: The text begins with an historical overview of trade policy issues to provide context for the theory. The text concludes with a detailed economic argument supporting free trade. The welfare analysis in the Ricardian, Heckscher-Ohlin and specific factors models emphasize the redistributive effects of free trade by calculating changes in real incomes. The trade policy chapter provides a comprehensive look at many more trade policies than are found in a printed textbook. A chapter about domestic policies contains an evaluation of domestic taxes and subsidies that are often ignored in traditional trade textbooks but are increasingly important as large countries complain more about each other's domestic agriculture policies and labor and environmental policies. The text uses the theory of the second-best to explain why protection can improve national welfare. This well-known theoretical result is rarely presented as methodically and consistently as it is in this text. 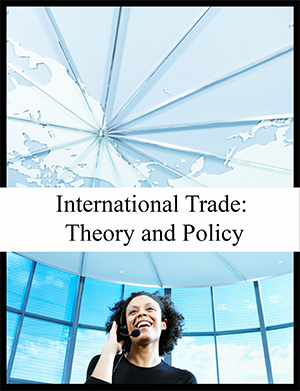 International Trade: Theory and Policy by Steve Suranovic is intended for a one-semester course in International Trade. After April 2010, you can check out the entire book online or request a desk copy. 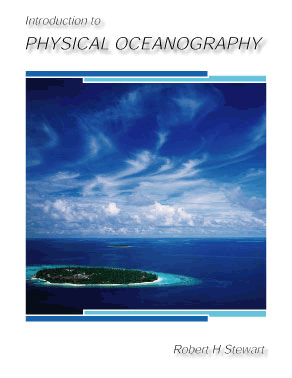 This textbook covers physical-oceanographic processes, theories, data, and measurements, targeted at upper-division undergraduates and graduate students in oceanography, meteorology, and ocean engineering. In addition to the classical topics, the author includes discussions of heat fluxes, the role of the ocean in climate, the deep circulation, equatorial processes including El Nino, data bases used by oceanographers, the role of satellites and data from space, ship-based measurements, and the importance of vorticity in understanding oceanic flows. Students should have studied differential equations and introductory college physics, although math is de-emphasized. Probability theory began in seventeenth century France when the two great French mathematicians, Blaise Pascal and Pierre de Fermat, corresponded over two problems from games of chance. Problems like those Pascal and Fermat solved continued to influence such early researchers as Huygens, Bernoulli, and DeMoivre in establishing a mathematical theory of probability. Today, probability theory is a wellestablished branch of mathematics that finds applications in every area of scholarly activity from music to physics, and in daily experience from weather prediction to predicting the risks of new medical treatments. This text is designed for an introductory probability course taken by sophomores, juniors, and seniors in mathematics, the physical and social sciences, engineering, and computer science. It presents a thorough treatment of probability ideas and techniques necessary for a form understanding of the subject. The text can be used in a variety of course lengths, levels, and areas of emphasis. For use in a standard one-term course, in which both discrete and continuous probability is covered, students should have taken as a prerequisite two terms of calculus, including an introduction to multiple integrals. In order to cover Chapter 11, which contains material on Markov chains, some knowledge of matrix theory is necessary. The text can also be used in a discrete probability course. The material has been organized in such a way that the discrete and continuous probability discussions are presented in a separate, but parallel, manner. This organization dispels an overly rigorous or formal view of probability and o?ers some strong pedagogical value in that the discrete discussions can sometimes serve to motivate the more abstract continuous probability discussions. For use in a discrete probability course, students should have taken one term of calculus as a prerequisite. Very little computing background is assumed or necessary in order to obtain full benefits from the use of the computing material and examples in the text. All of the programs that are used in the text have been written in each of the languages TrueBASIC, Maple, and Mathematica. David W. Ball of Cleveland State University brings his new survey of general chemistry text, Introductory Chemistry, to the market with a fresh theme that will be sure to hold student interest: "Chemistry is Everywhere." 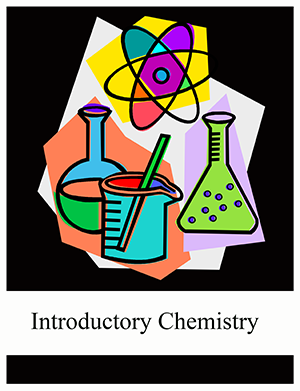 Introductory Chemistry is intended for a one-semester introductory or preparatory chemistry course. Throughout the chapters, David presents two features that reinforce the theme of the textbook, that chemistry is everywhere. The first is the boxed feature titled, appropriately, ”Chemistry is Everywhere“. This feature takes a topic of the chapter and demonstrates how this topic shows up in everyday life. In the introductory chapter, ”Chemistry is Everywhere“ focuses on the personal hygiene products that students may use every morning: toothpaste, soap, shampoo among others. These products are chemicals, aren’t they? This book explores some of the chemical reactions like the ones that give students clean and healthy teeth, and shiny hair. This feature makes it clear to students that chemistry is, indeed, everywhere, and it will promote student retention in what is sometimes considered an intimidating course. The second boxed feature focuses on chemistry that students likely indulge in every day: eating and drinking. In the ”Food and Drink App“, David discusses how the chemistry of the chapter applies to things that students eat and drink every day. Carbonated beverages depend on the behavior of gases, foods contain acids and bases, and everyone actually eats certain rocks. (Yikes!) Cooking, eating, drinking, metabolism — all chemical processes students are involved with all the time. These features allow students to see the things we interact with every day in a new light — as chemistry. Just like many of the one-semester chemistry books you may be used to, each section in David Ball's starts with one or more Learning Objectives, which list the main points of the section. Each section ends with Key Takeaways, which are reviews of the main points of the section. Each chapter is full of examples to illustrate the key points of the materials, and each example is followed with a similar ”Test Yourself“ exercise to see if the student understands the concept. Each section ends with its own set of paired exercises to practice the material from that section, and each chapter ends with a section of ”Additional Exercises“ that are more challenging or require multiple steps or skills to answer. David took the time to treat mathematical problems in Introductory Chemistry one of two ways, either as a conversion-factor problem or as a formula problem. David believes having two basic mathematical approaches (converting and formulas) allows the text to focus on the logic of the approach and not tricks or shortcuts; which speaks to the final point about Introductory Chemistry. You'll notice that David took no shortcuts with the material in this text, his inviting writing style, concise approach, consistent presentation, and interesting pedagogy have given it some of the best peer reviews we've seen at Flat World. So, order a desk copy or dive in now to see for yourself. 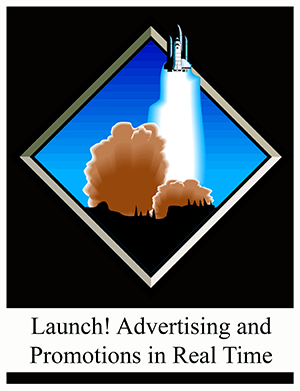 Launch! Advertising and Promotion is written for advertising and promotion courses taught to students in the business school and journalism & mass communication students. This textbook is the first of its kind to teach advertising concepts by reverse engineering a real advertising campaign from beginning to end. In April 2007, SS+K, an innovative New York City communications agency, launched the first ever branding campaign for msnbc.com with the tag "A Fuller Spectrum of News." Launch! follows that campaign from initial agency pitch through roll-out of print and media assets to post-campaign analysis. Throughout, it exposes readers to the theory and concepts of advertising and promotion, and the personalities and decisions that drove this campaign. The book takes a rare look ”behind the curtain“ — even letting you see some of the paths not chosen by the agency and client. Students get a realistic sense of how theory plays out in practice, and get a flavor for the exciting field of advertising and promotion. And, they consistently learn the perspectives of both the advertising agency (where many journalism and communications students will work) and the client (where many marketing majors will work). This is a unique book, with a unique perspective, by a unique author team, and you won't find this kind of insight in any other text on the market. We think you're going to love it! This textbook has been used in classes at: Ball State University, Emerson College, Florida Institute of Technology, Grand Valley State University, Johnson County Community College, Manchester Business School, McLennan Community College, Michigan State University, North Hennepin Community College, Pierce College, Rochester Institute of Technology, Saint Louis University, Salem State College, South Dakota State University, Texas State University, Texas Tech University, University of New Hampshire, University of North Carolina, University of Notre Dame, University of South Florida, Virginia Tech, Western Kentucky University. This text covers the standard material for a US undergraduate first course: linear systems and Gauss's Method, vector spaces, linear maps and matrices, determinants, and eigenvectors and eigenvalues, as well as additional topics such as introductions to various applications. It has extensive exercise sets with worked answers to all exercises, including proofs, beamer slides for classroom use, and a lab manual for computer work. The approach is developmental. Although everything is proved, it introduces the material with a great deal of motivation, many computational examples, and exercises that range from routine verifications to a few challenges. Russell Cooper and Andrew John have written an economics text aimed directly at students from its very inception. You’re thinking, ”Yeah, sure. 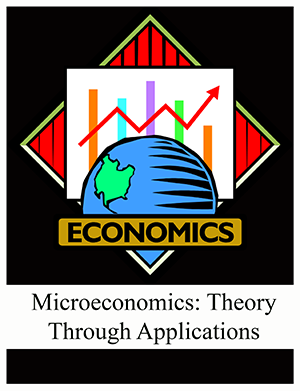 I’ve heard that before.“ This textbook, Microeconomics: Theory Through Applications, centers around student needs and expectations through two premises: … Students are motivated to study economics if they see that it relates to their own lives. … Students learn best from an inductive approach, in which they are first confronted with a problem, and then led through the process of solving that problem. Many books claim to present economics in a way that is digestible for students; Russell and Andrew have truly created one from scratch. This textbook will assist you in increasing students’ economic literacy both by developing their aptitude for economic thinking and by presenting key insights about economics that every educated individual should know. How? Russell and Andrew have done three things in this text to accomplish that goal: 1. Applications Ahead of Theory: They present all the theory that is standard in Principles books. But by beginning with applications, students get to learn why this theory is needed. The authors take the kind of material that other authors put in ”applications boxes“ and place it at the heart of their book. Each chapter is built around a particular business or policy application, such as minimum wages, the stock exchange, and auctions. Why take this approach? Traditional courses focus too much on abstract theory relative to the interests and capabilities of the average undergraduate. Students are rarely engaged and the formal theory is never integrated into the way students think about economic issues. And traditional books are organized around theoretical constructs that mean nothing to students. The authors’ applications-first approach ensures that students will not see chapters with titles like ”Cost Functions“ or ”Short-Run Fluctuations“. They introduce tools and ideas as and when they are needed. Each chapter is designed with two goals. First, the application upon which the chapter is built provides a ”hook“ that gets students’ attention. Second, the application is a suitable vehicle a vehicle for teaching the principles of economics. 2. Learning through Repetition: Important tools appear over and over again, allowing students to learn from repetition and to see how one framework can be useful in many different contexts. Each piece of economic theory in this text is first introduced and explained in the context of a specific application. Most are re-used in other chapters, so students see them in action on multiple occasions. As students progress through the book, they accumulate a set of techniques and ideas. These are collected separately in a ”toolkit“ that provides students with an easy reference and also gives them a condensed summary of economic principles for examination preparation. 3. A Student’s Table of Contents vs. An Instructor’s Table of Contents: There is no further proof that Russell and Andrew have created a book aimed specifically at educating students about economics than their two tables of contents. The Student’s Table of Contents speaks to students, piquing their interest to involve them in the economics, and a Instructor’s Table of Contents with the economics to better help you organize your teaching—and frankly, you don’t need to get excited by economics, you already are.